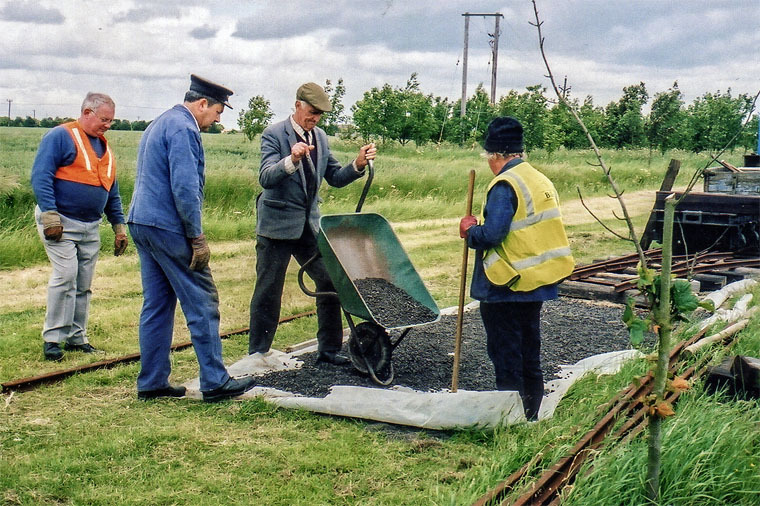 LCLR Mr W Woolhouse with barrow in 2002: Bill Woolhouse placing ballast ready for the sleepers and rails to be laid on completion of the track of the relocated Lincolnshire Coast Light Railway at South Loop, in the Skegness Water Leisure Park in 2002, with (right) fellow Director Astling Evison and (left) two volunteers who have been involved with the LCLR since 1961, Chris Bates (left) and Jim Smith. (Photo: Dave Enefer). 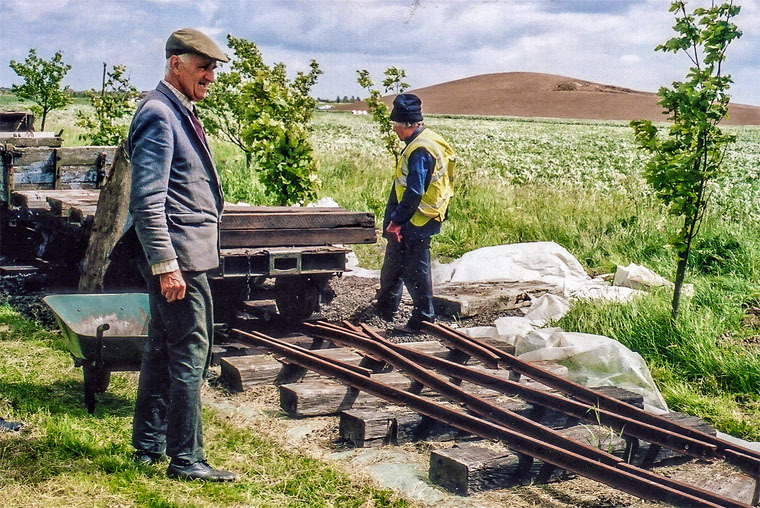 LCLR Mr W Woolhouse on left in 2002-1: Bill Woolhouse at work on the completion of the relocated Lincolnshire Coast Light Railway at South Loop, in the Skegness Water Leisure Park in 2002, with fellow LCLR Director, Astling Evison. (Photo: Dave Enefer). William Woolhouse ( -2017) of Fotherby, Louth, Lincolnshire. Founder of The Lincolnshire Coast Light Railway Co. Ltd.
"It is with great regret that the Lincolnshire Coast Light Railway, the first railway in the world to be built by railway enthusiasts, announces the death on Thursday 16th March in the Diana, Princess of Wales Hospital, Grimsby, of its founder, Company Secretary, Director and former General Manager, Mr. William Woolhouse, of Fotherby, Louth, Lincolnshire. He was 91. He played a founding and active role in the establishment of the world's first preserved railway, the Tal-y-llyn, in mid-Wales (as member number 13 of its preservation society) and played crucial roles in saving the Ffestiniog Railway and the Welshpool & Llanfair Railway before, with other like-minded Lincolnshire railway enthusiasts, building in 1960, the Lincolnshire Coast Light Railway to link the bus terminus at Humberston, south of Cleethorpes, with the nearby beach and holiday camp. The Railway utilised equipment mainly from the trench railways of the First World War which had in turn, been used to transport potatoes across the fens by the Nocton Estates Railway, near Lincoln. At its peak, the LCLR carried 60,000 passengers a year, until changing holiday patterns caused its closure in 1985. He located a new site and helped rebuild the line in the Skegness Water Leisure Park and was able to participate in its reopening in 2009. There was much more to Bill (as he was always known) than his life-long passion for railways. He was deeply interested in everything to do with Lincolnshire and its history and heritage, especially that of Louth and the Lincolnshire Wolds. He had a detailed memory of the town's old shops, trades, businesses and characters – and of course, Louth's long-closed railways and the people who worked on them. Bill's interest in railways began when his mother took him from Fotherby Halt to Louth on the “Louth motor train” – a steam powered railcar where he was allowed to stand next to the driver. When he was old enough to attend St. James' Choir School in Grimsby, he again travelled on the steam rail motor from Fotherby each day. His first venture into operating a railway began with his friend John Burdett, with whom he took a model steam train to fêtes and garden parties, on which to give rides to children. Later he built a five-inch gauge railway in the grounds of his home. The LCLR's spokesman, John Chappell, said: “We have lost a truly unique person with Bill's passing. He was devoted to the Railway he had helped to create and operate. He was involved in relaying the track and preparing everything for re-opening. He was a Director for nearly 60 years, Company Secretary for most of the past half-century and General Manager at Humberston, actively involved to the end of his life." Bill's other interests included Fotherby Parish Council, Fotherby Almhouses Trust and the Conservative Hall Trust; he produced much of his own food (including honey), built his own swimming pool and at the age of 89, published his first book “Recollections of a Lincolnshire Railway Enthusiast,” containing rare and previously unseen photographs of such long-vanished railways as those which once connected Louth to Bardney and Mablethorpe and to the wider world. He organised many excursion trains and recalled he was one of the few people to have enjoyed a drink in a railway buffet car in a train passing through the long-closed Withcall Tunnel on the Louth to Bardney line in 1954, during a rail-tour that took in the branch lines to Horncastle, Spilsby and other places long erased from the railway map. He helped organise train trips from throughout the Louth Parliamentary Constituency to London for Louth Conservative Association (for whom his father was agent) and also long-distance excursions from Alford, Louth, Grimsby and the surrounding villages as “North Lincolnshire Railtours”, to destinations in Scotland, North Wales and the Lake District -- on one occasion, hiring the world's fastest steam locomotive, the “Mallard” to pull the train. The idea now, of a through train running out and back in a day from Fotherby Village Halt to a remote destination in Snowdonia or The Lakes, seems improbable – but Bill (with a group of like-minded friends) made it happen. He had worked as a young man at Grimsby Labour Exchange and later in the treasurer's department of Louth Borough Council, eventually leaving to concentrate on private interests. He eschewed many of the comforts of the modern world – living without a telephone or television; Bill was an only child and did not marry. His interests included cycling and he once (in his late 50s) pedalled around some of Ireland's most mountainous and remote areas, following the routes of the old County Donegal and other long-vanished railways, which he had photographed before their closure in the 1950s. Richard Shepherd, Chairman of the LCLR Historic Vehicles Trust, said: “There was much more to Bill than his involvement with railways, especially his love of Lincolnshire and everything to do with the county, but many people came to know him through his interest in railways. He ensured that historic vehicles which the LCLR Company had no further need for, were made available to our charity for conservation. We're all very sorry that Bill will not be able to take to the tracks with us again, but our Railway and indeed all the world's heritage railways, are very much part of Bill's legacy. He was unique. We will all miss him”. Steve Mansfield, Bill's carer in recent years, said: “His memory of anyone and anything to do with Lincolnshire and railways was extraordinary: he had worked with my grandfather at Grimsby Labour Exchange and knew my father, an engine driver at Louth. He could recall all the old shops and buildings which have long since vanished from the Louth area." “Bill was a remarkable, independent, very single-minded person, whose passing leaves a gap in the lives of so many people far beyond the village of Fotherby and 'his' railway at Skegness. In a way, he was the last of 'old Louth'”. " This page was last edited on 18 September 2017, at 16:14.